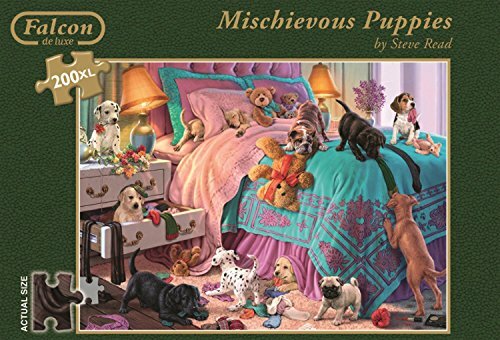 'Mischievous Puppies' is the title of this adorable 200XL piece Falcon de Luxe jigsaw puzzle that is part of the Animals collection. 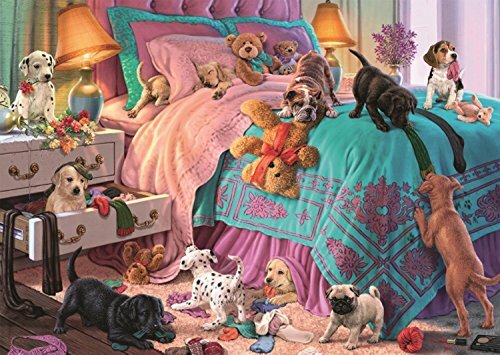 The 200XL piece jigsaw puzzle portrays a once tidy bedroom, we assume, that has been disturbed by a host of twelve adorable puppies who are creating all sorts of 'trouble' by playing in the bedside table draws, underneath the bed, behind the pillows and of course, they are throwing around the decorative teddy bears...as all puppies do. 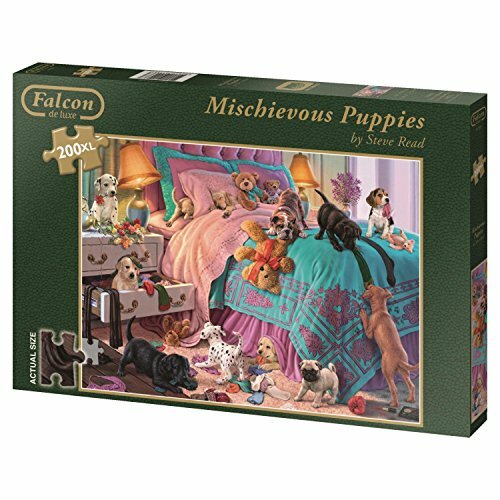 These jigsaw puzzles have been painted by the very talented artist Steve Read who has captured the adorable nature of the Puppies being mischievous...but extremely adorable. 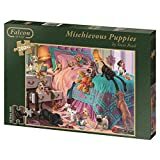 The finished size of both the 200XL piece puzzles measure 35 x 30cm (approximately) and has been produced using a high quality cardboard to ensure every jigsaw piece maintains its original shape time and time again. 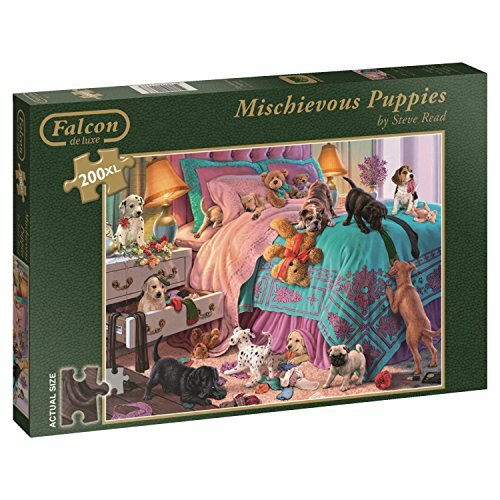 Today's Falcon de luxe puzzles are designed and crafted with the same passion for excellence that we have always had. They celebrate Falcon's distinctive brand values of heritage and innovation. We choose only the most suitable illustrations for our jigsaws. We die-cut each jigsaw piece carefully, so when the jigsaw is completed, it looks more like a poster than a puzzle. Making jigsaws has always been, and will always remain, our passion.